NILAI: GD Development Sdn Bhd is undertaking a mixed development, Green Beverly Hills in Putra Nilai, that could potentially generate a total of RM5.3bil in gross development value (GDV) when completed in eight years. Its joint chairman Datuk Yeat Sew Chuong said the project, which comprises residential properties and commercial properties as well as a hotel, would be developed in seven phases. “The first phase comprises the development of 334 condominium units and 61 bungalows. “Our condominium project is over 75% taken up even before the official launch today and we plan to launch our bungalows in two months,” he told StarBizWeek yesterday at the launch of Green Beverly Hills. The condominiums were priced from RM380 to RM580 per sq ft and piling work started last month, he said, adding that the first phase development would generate a total GDV of RM315mil. “Green Beverly Hills is located on 350 acres freehold land in Putra Nilai, which is the new name for Bandar Baru Nilai, a distinct and well-planned integrated township with modern infrastructure and amenities,” he said. He added that Green Beverly Hills offered a greener living experience. Located 15 minutes from Putrajaya and the KL International Airport, and 30 minutes to Kuala Lumpur city centre, Putra Nilai is already known for its up and coming biotech hub, regional education hub and trading/commercial hub. Yeat, who is also chief executive officer of Bursa Malaysia-listed INS Bioscience Bhd, said GD Development was a joint venture between him and Tan Sri Gan Kong Seng, chairman of Nilai Resources Group Bhd in their personal capacity. The project did not involve INS, said Yeat. Gan is also joint chairman for GD Development. “This is my personal investment and I will responsible for the property development while Gan is the land owner,” Yeat said. KUALA LUMPUR: UEM Land Holdings Bhd’s proposed takeover of Sunrise Bhd for RM1.39bil, or RM2.80 per share, has received an acceptance level of 40.3% from three major shareholders of Sunrise. “We do not intend to maintain the listing status of Sunrise if the public shareholding spread of Sunrise is not met pursuant to the offer,” Wan Abdullah said at a briefing to announce the takeover offer on Thursday. He said the proposed takeover was conditional upon UEM Land receiving valid acceptances of more than 50%. “If we don’t get that (50%), we will take a walk (from the deal),” he said. UEM Land will take the necessary procedures to withdraw Sunrise’s listing status if it secures more than 75% acceptance. However, Wan Abdullah was confident the deal was “primed for success” given that the group had already received 40% acceptance level. He said there were synergies between the two companies as UEM Land was a township developer while Sunrise was a niche high-end developer. Sunrise has a market capitalisation of some RM1.24bil (as at Nov 2) while UEM Land is currently the country’s largest property company with over RM8.23bil in market capitalisation.The combined market capitalisation of Sunrise and UEM Land will be close to RM10bil. UEM Land will be offering Sunrise shareholders two options under its proposed takeover offer. Under the first option on share swaps, Sunrise shareholders will receive 1.33 UEM Land shares priced at RM2.10 apiece for every Sunrise share held. The redeemable convertible preference shares (RCPS) option will see UEM Land issuing Sunrise shareholders RCPS at RM1 each based on 2.8 consideration RCPS per Sunrise share. The RCPS, with a tenure of two years, will not be entitled to dividends and will not be listed. The RCPS are convertible into UEM Land shares at RM2.30 per share anytime during their tenure and are redeemable at 100% of their issue price only at maturity. Assuming that a shareholder holds 1,000 Sunrise shares and opts for option one, he would receive 1,333 UEM Land shares. If he were to opt for option two, he would receive 2,800 RCPS. While some analysts said UEM Land’s offer was a positive proposition, other analysts were less optimistic. An analyst said the merger may be a catalyst for further appreciation in UEM Land’s share price. Another analyst said given that both companies had very different operating environments, it would take some efforts to merge their operations. “I guess anything is possible at the moment. It makes business sense to merge as UEM Land develops townships while Sunrise builds high-end properties,” an analyst said, adding that they may have to resolve some cultural differences between the two. ECM Libra head of research Bernard Ching said at first look, the takeover offer price of RM2.80 significantly fell short of its revised net asset value (RNAV) estimate of RM3.46 for Sunrise. “But taking into account the net interim dividend of 20 sen, the total return to Sunrise shareholders is actually RM3, just 13% short of our RNAV,” he said. On paper, shareholders who prefer to cash out could opt for the RCPS but would have to wait two years before redemption. “However, we believe shareholders are better off selling Sunrise shares on or after the ex-date of interim dividend on Nov 18 if they wish to cash out. This is because of the opportunity cost over two years since the RCPS will not be listed,” Ching said. Despite this, Ching believed the RCPS offered a “more attractive entry into UEM Land” as it was essentially a synthetic call option on UEM Land shares which would allow Sunrise shareholders to benefit from the upside of UEM Land shares but with limited downside risk. Post-takeover, assuming 100% acceptances under the share swap option, Tong, Tan and Lim would end up with 6% in UEM Land and other Sunrise shareholders 9%. UEM Group Bhd will have a 65% stake in UEM Land and the balance 20% by other UEM Land shareholders. 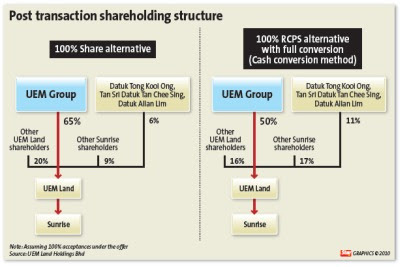 On the other hand, if the RCPS option gets 100% acceptances, upon the RCPS’ full conversion, Tong, Tan and Lim would hold a 11% stake in UEM Land, other Sunrise shareholders 17%, UEM Group 56% and other UEM Land shareholders 16%. The RM2.80 offer price represents a premium of 11% to Sunrise’s last trading price of RM2.52. However, the offer price represents a premium of 30.4% to the 1-month volume weighted average price of Sunrise shares to Nov 2, after taking into consideration the interim dividend of 20 sen announced on Wednesday. UEM Group Bhd group managing director/chief executive officer Datuk Izzaddin Idris said the offer, if successful, would result in the creation of an enlarged property developer with significant size, complementary expertise, capabilities and an asset base of about RM5bil. On the rationale, UEM Land said the group’s vast land bank in Nusajaya was expected to be the engine for growth and sustainable income over the mid- to long-term. However, as the Nusajaya projects were still under various stages of development, UEM Land’s current/historical profitability was not reflective of the value potential of such land holdings. The proposed exercise is expected to provide immediate enhancement to UEM Land’s earnings as it would be able to consolidate the financial results of Sunrise and leverage on its strong existing pipeline developments. “By leveraging on Sunrise’s robust financial strength and prospects, UEM Land is expected to be better positioned to accelerate its own business expansion and to secure new development projects,” UEM Land said in a statement. Wan Abdullah said the group faced geographical risk as most of its landbank was in Johor and thus needed to diversify its landbank. Kiara/Dutamas, around the KL City Centre and its upcoming projects in Kajang and Shah Alam. Meanwhile, Tong said he was excited at the prospects of Sunrise being part of the enlarged UEM group. “Together, the new entity will have the size, means, capabilities and management experience and foresight to offer more comprehensive and diversified product range not just in Malaysia but regional as well,” he said. Izzaddin and Wan Abdullah would be appointed to the Sunrise board with the latter assuming the position of managing director. Asked if the merger was his way out, Tong said it was “hardly an indication” that he was getting out as he would remain on the Sunrise board as chairman. “Realistically, for me to try to make Sunrise as huge and be a regional and global player the likes of CapitaLand may be impossible, or may take the rest of my life,” Tong said. KUALA LUMPUR: Bandar Raya Developments Bhd (BRDB), which recently signed supplemental agreements with UEM Land Bhd, the master developer of Nusajaya, to buy a 60% stake in a special-purpose vehicle used for the development of Residential North in Puteri Harbour, is planning to expand its presence in the township. The project, on a 111-acre freehold parcel, would be launched in the third quarter of next year and would be completed in six phases over seven years. The expected gross development value (GDV) for the project is RM2.3bil. BRDB chief executive officer Datuk Jagan Sabapathy said the partnership with UEM Land was just the first step in a strategy to grow the company’s presence in Nusajaya, the flagship township of the special economic zone of Iskandar Malaysia in Johor. The signing of the agreements was a follow-up to the July announcement by BRDB of the acquisition of the stake in Haute Property Sdn Bhd, the special-purpose vehicle set up for the Residential North project, from Dubai World, the emirate of Dubai’s flagship investment arm. BRDB paid RM75mil for the stake and would be advancing a further RM70mil to Haute Property for the developmental rights to the project after Dubai World pulled out as a result of the global financial crisis. “We’re still looking at a couple more tie-ups within Nusajaya, we’re taking a longer-term view of the region and its prospects,” Jagan told StarBizWeek. He added that besides Nusajaya, the company still had about 300 acres undeveloped in the 1,400-acre freehold Bandar Baru Permas Jaya, also in Johor, where it recently launched the 35-acre Straits Residences, a strata-titled landed project. Jagan said among projects in the pipeline for the Klang Valley was a 25.25-acre freehold plot slated for commercial development in Subang Jaya next to the Federal Highway, which the company acquired for RM125.86mil in early 2008. “The plans have been submitted to the relevant authorities and we’re also contemplating acquiring a neighbouring plot of land to build a railway stop for the project,” he said. Besides Subang Jaya, he said other projects in the pipeline included the first phase of the Hartamas II condominiums located north of Mont Kiara which, according to earlier reports, could have a GDV of RM300mil next year. As for its overseas ventures, Jagan said the company, in partnership with Defense Housing Authority of Lahore, had completed the first residential phase in the 400-acre Defense Raya together with the golf course. “We’ve also launched smaller residential units but we feel that the situation in Pakistan has to settle down first,” he said, referring to the country’s volatile political situation. Last year, property agency Savills Rahim & Co introduced the first phase of NEO Bankside, a British property located in prime central London, to Malaysians. The first block, known as Pavilion A, had prices starting at £1,000 per sq ft for a one-bedroom apartment of slightly more than 500sq ft. It did seem pretty steep when most of the British properties being marketed in Malaysia were priced at about £200,000 for a one-bedder. Nonetheless, of the 80 units that comprised block A and B, Malaysians bought 10 units of NEO Bankside. About two weeks ago, the agency marketed the third block. Prices have upped about 10% to 15% from last year. Located south of the River Thames, NEO Bankside is located in South Bank, in an area that runs along the southern edge of the Thames from Westminster Bridge to London Bridge. Jointly developed by Native Land Ltd and Grosvenor, the 200-unit project is located in what is known as the cultural hub of London. Gray was in Kuala Lumpur recently to touch base with buyers from the previous phase and to unveil the third of the four-block project. Native Land development executive Nicholas Gray says notable features in the vicinity include art museum Tate Modem, Blackfriars Bridge and Station which spans the river, a new mall One New Change which is due to open in 2012, a second Hilton hotel with 280 rooms and the Borough Market, known to be London’s oldest market. The area of South Bank has undergone tremendous change over the last 10 to 15 years. Similar with what’s taking place in several parts of London, NEO Bankside is part of the huge regeneration process that is under way there. Like other parts of the capital undergoing regeneration – where old derelict buildings are torn down and new buildings take their place – South Bank has over the years boasted some of the finer names in architecture. The catalyst for the area is Tate Modem, formerly a derelict power station. Today, the art museum receives millions of visitors every year. The other catalyst is the Millennium by Sir Norman Foster. (Foster designed the Troika, a project by BRDB Bhd in the KLCC area). A new mall One New Change, about 10 minutes walk from NEO Bankside, will be another landmark in South Bank. The most ecclesiastical of NEO’s neighbour will be St Paul’s Cathedral across the river. South Bank and its surroundings on both sides of the Thames have brought together some of the most famous architects. Among them Sir Christopher Wren (St Paul’s), Tate Modem (Giles Gilbert Scott and Jacques Herzog) and Richard Rogers for NEO. Rogers is also the architect for One Hyde Park, one of the most upmarket real estate in London at £6,000 psf. Gray says the main qualities of NEO Bankside are its quality, both in terms of design and construction, its location in the city by the river and the landmarks around it, on both sides of the Thames. Native Land is specifically a prime central London developer, which is different from a house builder. In Malaysia, when one buys into a project, most of the time, if not all the time, it is a project undertaken by a developer. In England, the situation is slightly different. There, developers and house builders also undertake projects. Both Native Land and Grosvenor are developers. Native Land was formed seven years ago by the former senior management of Taylor Woodrow Capital Developments and it is today a residential and mixed-use developer. Grosvenor’s expertise is in prime London residential market and it has total assets worth £12.6bil. NEO Bankside is located in what property consultancy Knight Frank says is a maturing market. In its review of South Bank, its head of residential research Liam Bailey says South Bank has succeeded in creating its own identity and cemented its reputation as London’s cultural hub, a sentiment reflected in its contemporary architecture and physical landscape. He says residential demand on South Bank is currently identifiable from two key sources – overseas purchasers and cash-rich domestic buyers. “The weaker pound alone has created a compelling buying opportunity for international purchasers,” the report says. A significant driver for investment comes from educational requirements. South Bank is within a 30-minute tube ride of seven universities including The London School of Economics, Central St Martins and Goldsmith’s. 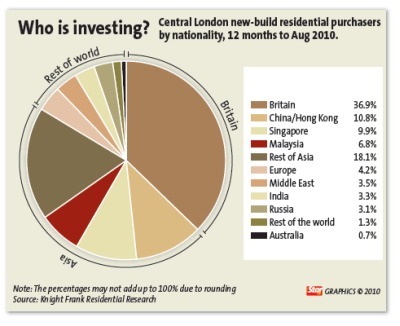 Most of the Malaysians who have bought British properties do so because they have children studying there. Other international buyers invest for the same reason. Over the past decade, the number of international students studying in Britain has risen by 175%. The strongest growth comes from China, India and Pakistan. The number of Chinese students rose 11.7 times from 4,017 in 1998/99 to 47,035 in 2008/09. In many cases, investors look to buy to cover the period of their child’s stay at university, and the properties are then retained as a long-term investment, the Knight Frank report says. Diversification is the other reason for their investment. Many view the current global financial crisis as a once-in-a-lifetime event and the fall in the Sterling presents itself as a buying opportunity. With fears of price bubbles in China, Hong Kong, Singapore and even in Malaysia, governments in these countries have already taken steps to cool the prices. 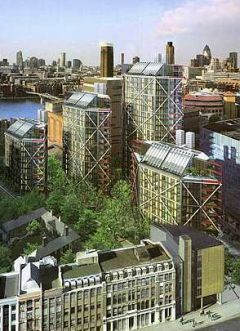 “Their success, or otherwise, will have repercussions for the central London market. Initial feedback from our Asian teams suggests that there is a strong potential for the negative impact of lower housing wealth in Asia to be at least partially offset by a desire for investors to target safe haven locations such as London,” the report says. Eyesore: Ara Damansara residents are worried that the proposed developments would end up like this abandoned Platinum Damansara project along PJU1A/3. MORE talk of hijacked institutional land surfaced during a public hearing at the Petaling Jaya City Council (MBPJ) headquarters recently. About 20 Ara Damansara residents attended two back-to-back public hearings to raise their concerns about the proposed development of two projects on PJU 1A/20. The session was chaired by MBPJ councillor Tiew Way Keng and attended by officers from the engineering and town planning departments. The same group of residents had earlier attended two briefing sessions by the developers and had raised several issues regarding the projects. — The Ara Green wellness and healthcare city comprising six blocks of 15-storey buildings, one block of 12-storey service apartments, one four-storey medical centre and two storeys of retail podium. Among some of the issues they raised during the first two rounds of dialogues were traffic congestion, safety, risk of abandonment, drainage and risk of flooding. The residents, led by representative Shawn Chong put up an impressive presentation to back their objection to the projects. He said residents had obtained the master plan of the Ara Damansara area from the developer of their residential area, which showed that the plots of adjacent land on which the developments would take place was meant for recreation and had been sub-divided and sold without their knowledge. “The land where the now-abandoned Platinum Damansara project stands was meant for a secondary school and the site of the Taipan 1 commercial area was meant for a primary school,” he added. StarMetro in June had highlighted a similar case in Bandar Utama, where at least 12 plots of land surrendered to the state for institutional purposes was now being used for commercial buildings. “We have no schools in Ara Damansara now and we have to drive quite a distance to send our children to school,” said one resident at the hearing. Subang MP Sivarasa Rasiah’s aide Peter Chong, who was also present at the hearings, said the hijacked land was a state government issue and he suggested that residents file a complaint with the Special Select Committee on Competence, Accountability and Transparency (Selcat). “If they find that there is abuse in the transfer of land, then the matter can be taken to MACC,” he said. On other matters, residents said there were already many commercial lots in the area that were unoccupied. They also raised the point that the developer of the first project was not the owner of the land, which made its application invalid. “Both developments will be tapping into the existing infrastructure such as sewage treatment and water supply, and our developers have told us that the infrastructure that they put in place is only for their own development,” said Shawn. Residents even created a three-dimensional simulation of how the traffic flow would be along Jalan PJU1A/20 if both of the projects under objection were allowed to be carried out. — Widening of Jalan Lapangan Terbang Subang near Subang toll. Residents were also not satisfied that the first developer had not submitted any traffic study for their development. “According to the traffic study submitted by the second developer, the traffic condition of Jalan Lapangan Terbang during rush hours was already currently at level F, which is the worst level. What is going to happen once the the few ongoing developments are ready and these two projects are allowed to go ahead?” said resident C.P. Lim. After the two hearings, another group of Ara Damansara residents attended a third one regarding another development located near the NZX commercial centre, comprising one 28-storey tower, 21 storeys of service apartments and two storeys of retail shops. Tiew said the applications for the projects would be tabled at the One-Stop Centre committee meeting on Nov 15.